Objective To provide a clear terminology and classification of muscle injuries in order to facilitate effective communication among medical practitioners and development of systematic treatment strategies. Methods Thirty native English-speaking scientists and team doctors of national and first division professional sports teams were asked to complete a questionnaire on muscle injuries to evaluate the currently used terminology of athletic muscle injury. In addition, a consensus meeting of international sports medicine experts was established to develop practical and scientific definitions of muscle injuries as well as a new and comprehensive classification system. Results The response rate of the survey was 63%. The responses confirmed the marked variability in the use of the terminology relating to muscle injury, with the most obvious inconsistencies for the term strain. In the consensus meeting, practical and systematic terms were defined and established. 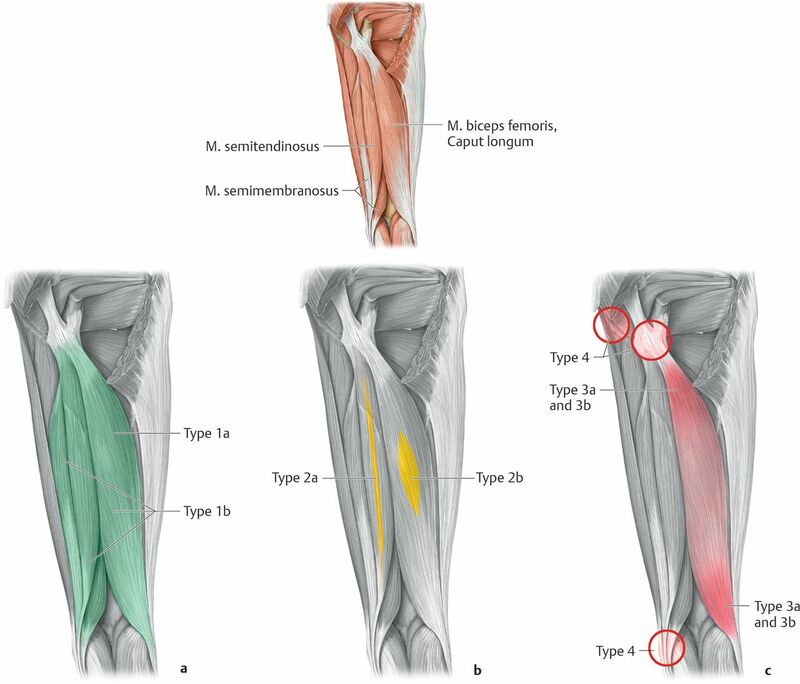 In addition, a new comprehensive classification system was developed, which differentiates between four types: functional muscle disorders (type 1: overexertion-related and type 2: neuromuscular muscle disorders) describing disorders without macroscopic evidence of fibre tear and structural muscle injuries (type 3: partial tears and type 4: (sub)total tears/tendinous avulsions) with macroscopic evidence of fibre tear, that is, structural damage. Subclassifications are presented for each type. Conclusions A consistent English terminology as well as a comprehensive classification system for athletic muscle injuries which is proven in the daily practice are presented. This will help to improve clarity of communication for diagnostic and therapeutic purposes and can serve as the basis for future comparative studies to address the continued lack of systematic information on muscle injuries in the literature. What are the new things Consensus definitions of the terminology which is used in the field of muscle injuries as well as a new comprehensive classification system which clearly defines types of athletic muscle injuries. The fact that a male elite-level soccer team with a squad of 25 players can expect about 15 muscle injuries each season with a mean absence time of 223 days, 148 missed training sessions and 37 missed matches demonstrate their high relevance for the athletes as well as for the clubs.1 The relevance of muscle injuries is even more obvious if the frequency is compared to anterior cruciate ligament-ruptures, which occur in the same squad statistically only 0.4 times per season.14 Each season, 37% of players miss training or competition due to muscle injuries1 with an average of 90 days and 15 matches missed per club per season from hamstring injuries alone.15 Particularly in elite athletes, where decisions regarding return to play and player availability have significant financial or strategic consequences for the player and the team, there is an enormous interest in optimising the diagnostic, therapeutic and rehabilitation process after muscle injuries, to minimise the absence from sport and to reduce recurrence rates. However, little information is available in the international literature about muscle injury definitions and classification systems. Muscle strain presents one of the most frequently used terms to describe athletic muscle injury, but this term is still without clear definition and used with high variability. In football/soccer, 92% affect the four major muscle groups of the lower limbs: hamstrings 37%, adductors 23%, quadriceps 19% and calf muscles 13%.1 As much as 96% of all muscle injuries in football/soccer occur in non-contact situations,1 whereas contusions are more frequently encountered in contact sports, like rugby, American football and ice hockey.11 ,13 The fact that 16% of muscle injuries in elite football/soccer are re-injuries and associated with 30% longer absence from competition than the original injury1 emphasises the critical importance of correct evaluation, diagnosis and therapy of the index muscle disorder. This concerted effort presents a challenging task in light of the existing inconsistent terminology and classification of muscle injuries. The objective of our work is to present a more precise definition of the English muscle injury terminology to facilitate diagnostic, therapeutic and scientific communication. In addition, a comprehensive and practical classification system is designed to better reflect the differentiated spectrum of muscle injuries seen in athletes. To evaluate the extent of the inconsistency and insufficiency of the existing terminology of muscle injuries in the English literature a questionnaire was sent to 30 native English-speaking sports medicine experts. The recipients of the questionnaires were invited based on their international scientific reputation and extensive expertise as team doctors of the national or first division sports teams from the Great Britain, Australia the USA, the FIFA, UEFA and International Olympic Committee. The included experts were responsible for covering a variety of different sports with high muscle injury rates including football/soccer, rugby, Australian football and cricket. Qualification criteria also included long-term experience with sports team coverage which limited the number of available experts since team physicians often tend to change after short periods. The questionnaire (see online supplementary appendix 1) was divided into three categories: first, the experts were asked to individually and subjectively describe their definitions of several common terms of muscle injuries and to indicate if the term is a functional (non-structural) or a structural disorder/injury. In the second category, they were asked to associate synonym terms of muscle injuries such as strain and tear. In the final category, the experts were asked to list given number of muscle injury terms in the order their increasing injury severity. Following the completion of the survey, the principal authors (H-WM-W, LH and PU) organised a consensus meeting of 15 international experts on the basic science of muscle injury as well as sports medicine specialists involved in the daily care of premier professional sports and national teams. The meeting was endorsed by the International Olympic Committee (IOC) and the UEFA. During the 1-day meeting, the authors performed a detailed review of the structural and functional anatomy and physiology of muscle tissue, injury epidemiology and currently existing classification systems of athletic muscle injuries. In addition, the results of the muscle terminology survey were presented and discussed. Based on the results of the survey muscle injury terminology was discussed and defined until a unanimous consensus of group was reached. A new classification system empirically based on the current knowledge about muscle injuries was discussed, compared with existing classifications, reclassified and approved. After the consensus meeting, iterative draft consensus statements on the definitions and the classification system were prepared and circulated to the members. The final statement was approved by all coauthors of the consensus paper. Nineteen of the 30 questionnaires were returned for evaluation (63%). (Eleven experts did not respond even after repeated reminders.) Even though, this is a limited number, the responses demonstrated a marked variability in the definitions for hypertonus, muscle hardening, muscle strain, muscle tear, bundle/fascicle tear and laceration, with the most obvious inconsistencies for the term muscle strain (see online supplementary appendix 2). Relatively consistent responses were obtained for pulled muscle (Layman's term) and laceration. Marked heterogeneity was also encountered regarding structural versus functional (non-structural) muscle injuries. Sixteen percent of expert responders considered strain a functional muscle injury, whereas 0 percent considered tear a functional injury (see online supplementary appendix 3). Sixteen percent were undecided to both terms, 68 percent considered strain and 84 percent tear a structural injury (see online supplementary appendix 3). This confirms that even among sports experts considerable inconsistency exists in the use of muscle injury terminology and that there is no clear definition, differentiation and use of functional and structural muscle disorders. The results emphasised the need for a more uniform terminology and classification that reflects both, the functional and structural aspects of muscle injury. The following consensus statement on terminology and classification of athletic muscle injuries is perhaps best referred to as a position statement based upon wide-ranging experience, observation and opinion made by experts with diverse clinical and academic backgrounds and expertise on these injuries. Acute indirect muscle disorder ‘without macroscopic’ evidence (in MRI or ultrasound (for limitations see Discussion)) of muscular tear. Often associated with circumscribed increase of muscle tone (muscle firmness) in varying dimensions and predisposing to tears. Based on the aetiology several subcategories of functional muscle disorders exist. Any acute indirect muscle injury ‘with macroscopic’ evidence (in MRI or ultrasound (for limitations see Discussion)) of muscle tear. Further definitions reached in the consensus conference are presented in table 3 together with the classification system. Muscle injury terms with highly inconsistent answers in the survey were strain, pulled-muscle, hardening and hypertonus. Strain is a biomechanical term which is not defined and used indiscriminately for anatomically and functionally different muscle injuries. Thus, the use of this term cannot be recommended anymore. Pulled-muscle is a lay-term for different, not defined types or grades of muscle injuries and cannot be recommended as a scientific term. Hardening and hypertonus are also not well defined and should not be used as scientific terminology. The structure of the comprehensive classification system for athletic muscle injuries, which was developed during the consensus meeting, is demonstrated in table 2. A clear definition of each type of muscle injury, a differentiation according to symptoms, clinical signs, location and imaging is presented in table 3. The main goal of this article is to present a standardised terminology as well as a comprehensive classification for athletic muscle injuries which presents an important step towards improved communication and comparability. Moreover, this will facilitate the development of novel therapies, systematic study and publication on muscle disorders. As stated by Jarvinen et al17 current treatment principles for skeletal muscle injury lack a firm scientific basis. The first treatment step is establishment of a precise diagnosis which is crucial for a reliable prognosis. However, since injury definitions are not standardised and guidelines are missing, proper assessment of muscle injury and communication between practitioners are often difficult to achieve. Resultant miscommunication will affect progression through rehabilitation and return to play and can be expected to affect recurrence and complication rate. Studies in Australian Football League players have shown a high recurrence rate of muscle injuries of 30.6%.29 Other studies demonstrated recurrence rates of 23% in rugby30 and 16% in football/soccer.1 One plausible cause for recurrent muscle injures, which are significantly more severe than the first injury1 ,30 is the premature return to full activity due to an underestimated injury. Healing of muscle and other soft tissue is a gradual process. The connective (immature) tissue scar produced at the injury site is the weakest point of the injured skeletal muscle,17 with full strength of the injured tissue taking time to return depending on the size and localisation of the injury. (Note: mature scar is stiff or even stronger than healthy muscle.) It appears plausible, that athletes may be returning to sport before muscle healing is complete. As Malliaropoulos et al10 stated ‘it is therefore crucial to establish valid criteria to recognise severity and avoid premature return to full activity and the risk of reinjury’. The presented muscle injury classification is based on an extensive, long-term experience and has been used successfully in the daily management of athletic muscle injuries. The classification is empirically based and includes some new aspects of athletic muscle injuries that have not yet been described in the literature, specifically the highly relevant functional muscle injuries. An advanced muscle injury classification that distinguishes these injuries as separate clinical entities has great relevance for the successful management of the athlete with muscle injury and represents the basis for future comparative studies since scientific data are limited for muscle injury in general. In accordance with Askling et al31 ,32 and Jarvinen et al,17 we recommend to start with a precise history of the occurrence, the circumstances, the symptoms, previous problems, followed by a careful clinical examination with inspection, palpation of the injured area, comparison to the other side and testing of the function of the muscles. Palpation serves to detect (more superficial and larger) tears, perimuscular oedema and increased muscle tone. An early postinjury ultrasound between 2 and 48 h after the muscle trauma24 provides helpful information about any existing disturbance of the muscle structure, particularly if there is any haematoma or if clinical examination points towards a functional disorder without evidence of structural damage. We recommend an MRI for every injury which is suspicious for structural muscle injury. MRI is helpful in determining whether oedema is present, in what pattern, and if there is a structural lesion including its approximate size. Furthermore, MRI is helpful in confirming the site of injury and any tendon involvement.31 However, it must be pointed out, that MRI alone is not sensitive enough to measure the extent of muscle tissue damage accurately. For example, it is not possible to judge from the scans where oedema/haemorrhage (seen as high signal) is obscuring muscle tissue that has not been structurally damaged. Our approach is to include the combination of the currently best available diagnostic tools to address the current deficit of clinical and scientific information and lack of sensitivity and specificity of the existing diagnostic modalities. Careful combination of diagnostic modalities including medical history, inspection, clinical examination and imaging will most likely lead to an accurate diagnosis, which should be definitely mainly based on clinical findings and medical history not on imaging alone, since the technology and sensitivity to detect structural muscle injury continues to evolve. For example, the history of a sharp acute onset of pain, experience of a snap and a well-defined localised pain with a positive MRI for oedema but indecisive for fibre tear strongly suggest a minor partial muscle tear, below the detection sensitivity of the MRI. Oedema, or better the increased fluid signal on MRI, would be observed with a localised haematoma and would be consistent with the working diagnosis in this case. The diagnosis of a small tear (structural defect) that is below the MRI detection limit is important in our eyes, since even a small tear is relevant because it can further disrupt longitudinally, for example, when the athlete sprints. Ekstrand et al26 described a significantly and clinically relevant shorter return to sports in MRI negative cases (without oedema) compared to MRI grade 1 injuries (with oedema, but without fibre tearing). Similar findings are published also by others.33 However, muscle oedema is a very complex issue and in our opinion too little is known so far. Therefore, we decided to mention in the classification system that several functional disorders present ‘with or without’ oedema (table 3). This is in our eyes the best way to handle the currently insufficient data. We think that discussion of the phenomenon of oedema at this point is premature but will be a focus of high level studies in the future, with more precise imaging and with studies which are based on a common terminology and classification. An aspect that may contribute to a high rate of inaccurate diagnosis and recurrent injury is that terminology of muscle injuries is not yet been clearly defined and a high degree of variability continues to exist between terms frequently used to describe muscle injury. Since it has been documented that variations in definitions create significant differences in study results and conclusions,34–38 it is critically important to develop a standardisation. Hagglund et al34 defined ‘muscle strain’ as ‘acute distraction injury of muscles and tendons’. However, this definition is rarely used in the literature and in the day-to-day management of athletic muscle injuries. Our survey demonstrates that the term strain is used with a high degree of variability between practitioners. Strain is a biomechanical term; thus, we do not recommend the use of this term. Instead, we propose to use the term tear for structural injuries of muscle fibres/bundles leading to loss of continuity and contractile properties. Tear better reflects structural characteristics as opposed to a mechanism of injury. According to Fuller et al28 a sports injury is defined as ‘any physical complaint sustained by an athlete that results from a match/competition or training, irrespective of the need for medical attention or time loss from sportive activities’. That means also irrespective of a structural damage. By this definition, functional muscle disorders, irrespective of any structural muscle damage, present injuries as well. However, the term disorder may better differentiate functional disorders from structural injuries. Thus, the term functional muscle disorder was specifically chosen by the consensus conference. Functional muscle disorders present a distinct clinical entity since they result in a functional limitation for the athlete, for example, painful increase of the muscle tone which can represent a risk factor for structural injury. However, they are not readily diagnosed with standard diagnostic methods such as MRI since they are without macroscopic evidence of structural damage, defined as absence of fibre tear on MRI. They are indirect injuries, that is, not caused by external force. A recent UEFA muscle injury study has demonstrated their relevance in football/soccer.26 This study included data from a 4-year observation period of MRI obtained within 24–48 h after injury and demonstrated that the majority of injuries (70%) were without signs of fibre tear. However, these injuries caused more than 50% of the absence of players in the clubs.26 These findings are consistent with the clinical and practical observations of the experienced members of the consensus panel. Functional muscle disorders are multifactorial and can be grouped into subgroups reflecting their clinical origin including ‘overexertional’ or ‘neuromuscular’ muscle disorders. This is important since the origin of muscle disorder influences their treatment pathway. A spine-related muscle disorder associated with a spine problem (eg, spondylolysis), will better respond to treatment by addressing not only the muscle disorder but also the back disorder (ie, including core-performance, injections). One could argue, that this presents mainly a back problem, with a secondary muscle disorder. But, this secondary muscular disorder prevents the athlete from sports participation and will require comprehensive treatment that includes the primary problem as well in order to facilitate return to sport. Therefore, a broader definition and classification system is suggested by the consensus panel at this point which is important not only because of the different pathogenesis, but more importantly because of different therapeutic implications. Muscle fatigue has been shown to predispose to injury.39 One study has demonstrated that in the hind leg of the rabbit fatigued muscles absorb less energy in the early stages of stretch when compared with non-fatigued muscle.40 Fatigued muscle also demonstrates increased stiffness, which has been shown to predispose to subsequent injury (Wilson AJ and Myers PT, unpublished data, 2005). The importance of warm up prior to activity and of maintaining flexibility was emphasised since a decrease in muscle stiffness is seen with warming up.40 A study by Witvrouw et al41 found that athletes with an increased tightness of the hamstring or quadriceps muscles have a statistically higher risk for a subsequent musculoskeletal lesion. Delayed onset muscle soreness (DOMS) has to be differentiated from fatigue-induced muscle injury.42 DOMS occurs several hours after unaccustomed deceleration movements while the muscle is stretched by external forces (eccentric contractions), whereas fatigue-induced muscle disorder can also occur during athletic activity. DOMS causes its characteristic acute inflammatory pain (due to local release of inflammatory mediators and secondary biochemical cascade activation) with stiff and weak muscles and pain at rest and resolves spontaneously usually within a week. In contrast, fatigue-induced muscle disorder leads to aching, circumscribed firmness, dull ache to stabbing pain and increases with continued activity. It can—if unrecognised and untreated—persist over a longer time and may cause structural injuries such as partial tears. However, in accordance with Opar et al39 it has to be stated, that it remains an area for future research to definitely describe this muscle disorder and other risk factors for muscle injuries. Two different types of neuromuscular disorders can be differentiated: a spinal or spinal nerve-related (central) and a neuromuscular endplate-related (peripheral) type. Since muscles act as a target organ their state of tension is modulated by electrical information from the motor component of the corresponding spinal nerve. Thus, an irritation of a spinal nerve root can cause an increase of the muscle tone. It is known that back injuries are very common in elite athletes, particularly at the L4/5 and the L5/S1 level43 and lumbar pathology such as disc prolapse at the L5/S1 level may present with hamstring and/or calf pain and limitations in flexibility, which may result in or mimic a muscle injury.44 Orchard states that theoretically any pathology relating to the lumbar spine, the lumbosacral nerve roots or plexus, or the sciatic nerve could result in hamstring or calf pain.44 This could be transient and range from fully reversible functional disturbances to permanent structural changes, which may be congenital or acquired. Several other studies have supported this concept of a ‘back related’ (or more specifically lumbar spine related) hamstring injury15 ,33 ,45 although this is a controversial paradigm to researchers.44 However, this multifactorial type of injury would logically require variable forms of treatment beyond simply treatment of the muscle–tendon injuries.46 Thus, it is important that assessment of hamstring injury should include a thorough biomechanical evaluation, especially that of the lumbar spine, pelvis and sacrum.15 Lumbar manifestations are not present in all cases; however, negative structural findings on the lumbar spine do not exclude nerve root irritation. Functional lumbar disturbances, like lumbar or iliosacral blocking can also cause spine-related muscle disorders.47 The diagnosis is then established through precise clinical-functional examination. The spine-related muscle disorder is usually MRI-negative or shows muscle oedema only.44 Many clinicians also believe that athletes with lumbar spine pathology have a greater predisposition to hamstring tears,33 ,44 although this has not been prospectively proven. Verrall et al33 showed that footballers with a history of lumbar spine injury had a higher rate of MRI-negative posterior thigh injury, but not of actual structural hamstring injury. For anatomic illustration of the location and extent of functional muscle disorders see figure 1. Anatomic illustration of the location and extent of functional and structural muscle injuries (eg, hamstrings). (A) Overexertion-related muscle disorders, (B) Neuromuscular muscle disorders, (C) Partial and (sub)total muscle tears (from Thieme Publishers, Stuttgart; planned to be published. Reproduced with permission.). This figure is only reproduced in colour in the online version. The most relevant structural athletic muscle injuries, that is, injuries ‘with macroscopic’ evidence of muscle damage, are indirect injuries, that is, stretch-induced injuries caused by a sudden forced lengthening over the viscoelastic limits of muscles occurring during a powerful contraction (internal force). These injuries are usually located at the muscle–tendon junction,17 ,40 ,49 since these areas present biomechanical weak points. The quadriceps muscle and the hamstrings are frequently affected since they have large intramuscular or central tendons and can get injured along this interface.50 ,51 Theoretically, a tear can occur anywhere along the muscle–tendon–bone–chain either acutely or chronically. Exact knowledge of the muscular macro- and microanatomy is important to understand and correctly define and classify indirect structural injuries. The individual muscle fibre presents a microscopic structure with an average diameter of 60 μm.52 Thus, an isolated tear of a single muscle fibre remains usually without clinical relevance. 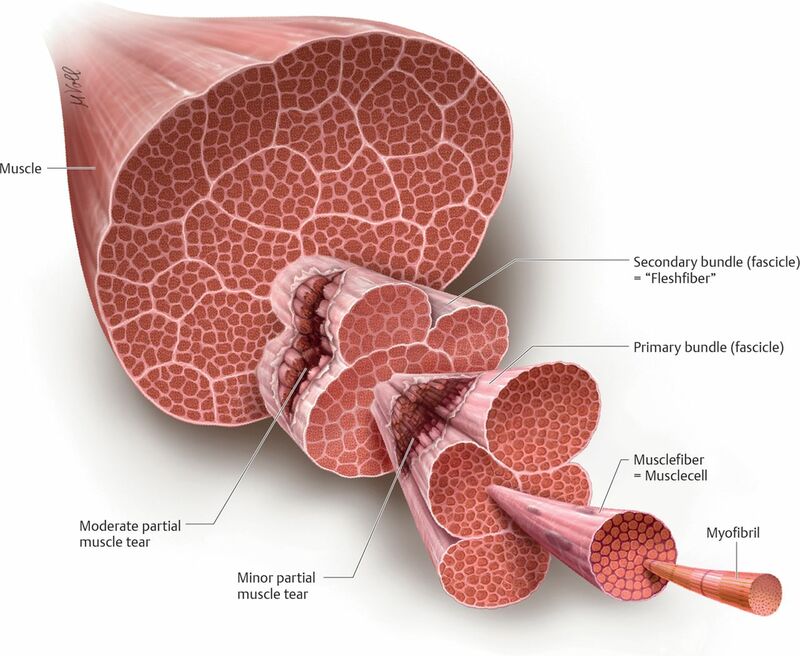 Muscle fibres are anatomically organised into primary and secondary muscle fascicles/bundles. Secondary muscle bundles (flesh–fibres) with a diameter of 2–5 mm (this diameter can vary according to the training status according to hypertrophy) are visible to the human eye.52 Secondary muscle bundles present structures that can be palpated by the experienced examiner, when they are torn. Multiple secondary bundles constitute the muscle (figure 2). Anatomic illustration of the extent of a minor and moderate partial muscle tear in relation to the anatomical structures. Please note, that this is a graphical illustration, there are variations in extent. (From Thieme Publishers, Stuttgart; planned to be published. Reproduced with permission.). This figure is only reproduced in colour in the online version. Most indirect structural injuries are partial muscle tears. Clinical experience clearly shows that most partial injuries can be assigned to one of two types, either a minor or a moderate partial muscle tear, which ultimately has consequences for therapy, respectively for absence time from sports. Thus, indirect structural injuries should be subclassified. Since previous graduation systems23 ,24 refer to the complete muscle size, they are relative and not consistently measurable. In addition to this, there is no differentiation of grade 3 injuries with the consequence that many structural injuries with different prognostic consequences are subsumed as grade 3. We recommend a classification of structural injuries based on anatomical findings. Taking into account the aforementioned anatomical factors and as a reflection of our daily clinical work with muscle injuries, we differentiate between minor partial tears with a maximum diameter of less and moderate partial tears with a diameter of greater than a muscle fascicle/bundle (see figure 2). In addition to the size, it is the participation of the adjacent connective tissue, the endomysium, the perimysium, the epimysium and the fascia that distinguish a minor from a moderate partial muscle tear. Concomitant injury of the external perimysium seems to play a special role: This connective tissue structure has a somehow intramuscular barrier function in case of bleeding. It may be the injury to this structure (with optional involvement of the muscle fascia) that differentiates a moderate from a minor partial muscle tear. Drawing a clear differentiation between partial muscle tears seems difficult because of the heterogeneity of the muscles that can be structured very differently. Technical capabilities today (MRI and ultrasound) are not precise enough to ultimately determine and prove the effective muscular defect within the injury zone of haematoma and/or liquid seen in MRI which is somewhat oversensitive at times17 and usually leads to overestimation of the actual damage. It will remain the challenge of future studies to exactly rule out the size which describes the cut-off between a minor and a moderate partial muscle tear. The great majority of muscle injuries heal without formation of scar tissue. However, greater muscle tears can result in a defective healing with scar formation17 which has to be considered in the diagnosis and prognosis of a muscle injury. Our experience is that partial tears of less than a muscle fascicle usually heal completely while moderate partial tears can result in a fibrous scar. Complete muscle tears, with a discontinuity of the whole muscle are very rare. Subtotal muscle tears and tendinous avulsions are more frequent. Clinical experience shows that injuries involving more than 50% of the muscle diameter (subtotal tears) usually have a similar healing time compared with complete tears. Tendinous avulsions are included in the classification system since they mean biomechanically a total tear of the origin or insertion of the muscle. The most frequently involved locations are the proximal rectus femoris, the proximal hamstrings, the proximal adductor longus and the distal semitendinosus. Intratendinous lesions of the free or intramuscular tendon also occur. Pure intratendinous lesions are rare. The most frequent type is a tear near the muscle–tendon junction (eg, of the intramuscular tendon of the rectus femoris muscle). Tendinous injuries are either consistent with the partial (type 3) or (sub)total (type 4) tear in our classification system and can be included in that aspect of the classification. For anatomic illustration of the location and extent of structural muscle injuries see figure 1. In contrast to indirect injuries (caused by internal forces), lacerations or contusions are caused by external forces,53 ,54 like a direct blow from an opponent's knee. Thus, muscle contusions are classified as acute direct muscle injuries (tables 2 and 3). Contusion injuries are common in athletes and present a complex injury that includes defined blunt trauma of the muscular tissue and associated haematoma.53 ,54 The severity of the injury depends on the contact force, the contraction state of the affected muscle at the moment of injury and other factors. Contusions can be graded into mild, moderate and severe.55 The most frequently injured muscles are the exposed rectus femoris and the intermediate vastus, lying next to the bone, with limited space for movement when exposed to a direct blunt blow. Contusion injury can lead to either diffuse or circumscribed bleeding that displaces or compresses muscle fibres causing pain and loss of motion. It happens that muscle fibres are torn off by the impact, but typically muscle fibres are not torn by longitudinal distraction. Therefore, contusions are not necessarily accompanied by a structural damage of muscle tissue. For this reason athletes, even with more severe contusions, can often continue playing for a long time, whereas even a smaller indirect structural injury forces the player often to stop at once. However, contusions can also lead to severe complications like acute compartment syndrome, active bleeding or large haematomas. This consensus statement aims to standardise the definitions and terms of muscle disorders and injuries and proposes a practical and comprehensive classification. Functional muscle disorders are differentiated from structural injuries. The use of the term strain—if used undifferentiated—is no longer recommended, since it is a biomechanical term, not well defined and used indiscriminately for anatomically and functionally different muscle injuries. Instead of this, we propose to use the term tear for structural injuries, graded into (minor and moderate) partial and (sub)total tears, used only for muscle injuries with macroscopic evidence of muscle damage (structural injuries). While this classification is most applicable to lower limb muscle injuries, it can be translated also to the upper limb. Scientific data supporting the presented classification system, which is based on clinical experience, are still missing. We hope that our work will stimulate research—based on the suggested terminology and classification—to prospectively evaluate the prognostic and therapeutic implications of the new classification and to specify each subclassification. It also remains definitely the challenge of future studies to exactly rule out the size which describes the cut-off between a minor and a moderate partial muscle tear.
. Rule violations as a cause of injuries in male Norwegian professional football: are the referees doing their job? Am J Sports Med 2004;32:62S–8S.
. Injuries to kickers in American football: the National Football League experience. Am J Sports Med 2010;38:1166–73.
. Profile of an American amateur rugby union sevens series. Am J Sports Med 2012;40:179–84.
. The epidemiology of US high school basketball injuries, 2005–2007. Am J Sports Med 2008;36:2328–35.
. Epidemiology of National Football League training camp injuries from 1998 to 2007. Am J Sports Med 2008;36:1597–603.
. Muscle injuries: biology and treatment. Am J Sports Med 2005;33:745–64.
. Hip and groin injuries in athletes. Am J Sports Med 2001;29:521–33.
. Muscle strain injury: diagnosis and treatment. J Am Acad Orthop Surg 1999;7:262–9.
. Gastrocnemius vs. soleus strain: how to differentiate and deal with calf muscle injuries. Curr Rev Musculoskelet Med 2009;2:74–7.
. Treatment of injuries to athletes. Philadelphia: WB Saunders, 1962.
. Quadriceps strain, rupture and charlie horse. Med Sci Sports 1969;1:106–11.
. Sonographic findings in muscle strain injury: clinical and MR imaging correlation. J Ultrasound Med 1995;14:899–905.
. MRI in orthopaedics and sports medicine. 3rd edn. Philadelphia: Wolters Kluwer/Lippincott, 2007.
. Consensus methods: characteristics and guidelines for use. Am J Public Health 1984;74:979–83.
. The influence of methodological issues on the results and conclusions from epidemiological studies of sports injuries: illustrative examples. Sports Med 2006;36:459–72.
. Influence of definition and data collection on the incidence of injuries in football. Am J Sports Med 2000;28:S40–6.
. Delayed-onset muscle soreness (DOMS). Dtsch Arztebl 2002;99:372–77.
. A pilot study of the prevalence of lumbar disc degeneration in elite athletes with lower back pain at the Sydney 2000 Olympic Games. Br J Sports Med 2003;37:263–6.
. Diagnostik und Therapie von Muskelzerrungen und Muskelfaserrissen. Sportorthop Sporttraumatol 2001;17:17–20.
. Physiologische Grundlagen und sportphysiologische Aspekte. In: Mueller-Wohlfahrt HW, Ueblacker P, Haensel L, eds. Muskelverletzungen im Sport. Stuttgart, Germany, New York: Thieme, 2010:73–4.
. Incomplete, intrasubstance strain injuries of the rectus femoris muscle. Am J Sports Med 1995;23:500–6.
. Atlas of Anatomy. Stuttgart, Germany, New York: Thieme, 2005.
. Muscle contusion injuries: current treatment options. J Am Acad Orthop Surg 2001;9:227–37.
. Diagnosis and management of quadriceps strains and contusions. Curr Rev Musculoskelet Med 2010;3:26–31.
. Quadriceps contusion. West Point update. Am J Sports Med 1991;19:299–304. Contributors H-WM-W: member of Conference, senior author of final statement, responsible for the overall content; LH: member of Conference, senior co-author of final statement; KM: member of Conference, co-author of final statement; JE: member of Conference, co-author of final statement; BE: member of Conference, co-author of final statement; SM: member of Conference, co-author of final statement; JO: member of Conference, co-author of final statement; NvD: member of Conference, co-author of final statement; GMK: member of Conference, co-author of final statement; PS: member of Conference, co-author of final statement; DB: member of Conference, co-author of final statement; LS: member of Conference, co-author of final statement; EG: member of Conference, co-author of final statement; PU: member of Conference, executive and corresponding author, responsible for the overall content. Funding The Consensus Conference was supported by grants from FC Bayern Munich, Adidas and Audi.